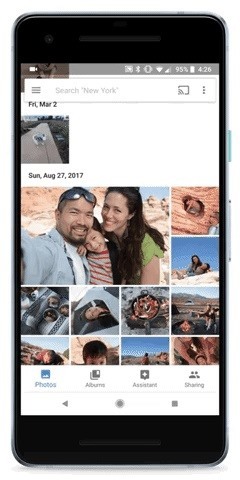 Google Photos is a fantastic service, giving you unlimited storage on either your Android or iPhone. With all this free space, some pictures can get lost in the shuffle. Fortunately, Google will now let users "Favorite" pictures — whereupon they're automatically put in their own standalone album. Favoriting pictures is integrated at the surface level of the app, so Google is clearly trying to implement a widely-requested feature that frankly should have existed in the first place. The ability to Favorite pictures should be rolling out to Google Photos on both iOS and Android within the coming weeks. To favorite a picture, go to Google Photos and tap on the photo. Once you open up the picture preview, hit the star icon in the top-right corner — when you do, it'll be favorited. If no controls are visible, tap your screen once to bring up the on-screen controls again. Now, hit the back icon in top-left corner to go back to the main screen, and tap the "Albums" tab along the bottom. Your favorited photos will be bundled into their own album called "Favorites," where they'll be sorted chronologically. Now you can eschew the clutter and only keep tabs on the pictures that you really care about. While it's a relatively small update, this is a welcome one for everyone who uses the insane amount of storage that Google simply gives away to their users.